Pali Plumies Offers the following Landscape Design Services to our valued Clients. These services include Landscape Design and planning,both are highlighted Below. 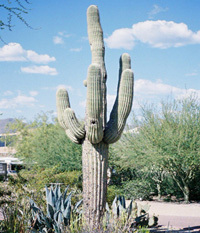 We also offer Landscape Consultations,which will as help you with proper plant selection and placement in your yard. 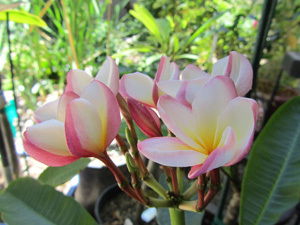 We offer many theme gardens these include,Tropical, Water Features and Xeriscape/Low Water Use Landscaping. We pride ourselves in creating a landscape that follows the Principles of Landscape Design. Landscape Design Services: This will include a landscape consultation and site analysis of your yard. The site analysis includes; a preliminary landscape design for your review/consultation to fully determine their wants and needs. This then leads to the creation of simple plan for review and evaluation by the landscape designer and the customer and from this simplified plan a final working plan will be created and submitted to our customers. This working a plan is design for use for bidding and contracting out the actual installation services, which our company does not offer at this time. Landscape Master Plan: We can this service at an additional charge and it would include the final detailed Master Plan for the landscape design project which would include a color rendered presentation plan formal presentations and for the client to retain for their records. 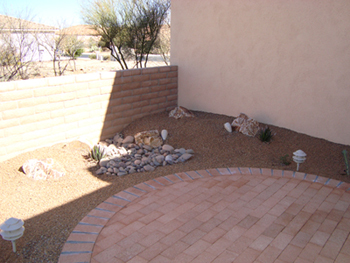 We are able to offer you either of these superior services depending on your landscaping needs. So let us talk to you about your desired landscape dreams. Because with our attention to detail we will be able to create you a first rate landscape design and landscaping plan that will be both aesthetically pleasing and functional so you will enjoy it for years to come. As a added bonus our landscape designs will add value to your home when and if you every decide to sell it. So Please let us work with you to make your landscape dreams come true. We also offer theme landscaping ideas for your landscaping plans these include; Tropical, Water Features and Xeriscape Landscapes. So please browse through these sections below for your landscaping theme. Tropical Oasis: Give your landscape the feeling of instant stress relief, lushness, and relaxation through the installation of a tropical themed landscape design plan. With proper irrigation, we can turn your property into an oasis. 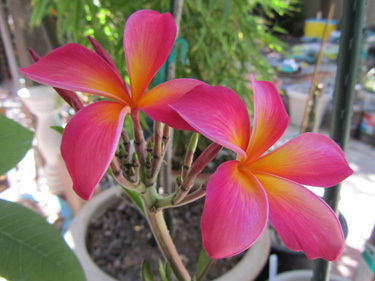 Through the use of sun loving tropical plants, such as; Palms, Plumerias,Hibiscus, Bamboos, Bird of Paradise and lush grasses along with properly place rock and stone outcroppings, and or winding pathways, we can give your home a feeling of being at a resort. 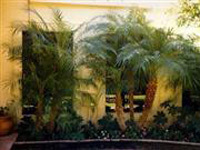 Include a water feature, and you are set with a tropical feel for your landscape. Call us or e-mail us today and tell us your ideas and wishes for this type of theme landscape or you can choose from our other landscape design options and themes that we can provide for your property. 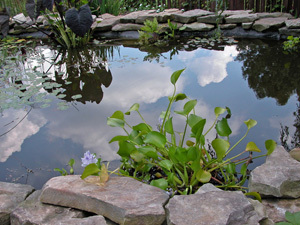 Water Feautures: You can enjoy the tranquil and relaxing sounds and movement of flowing water in your landscape by adding an outdoor fountain, waterfall, or pond. Our team of professionals can design an array of outdoor water features with varying sizes and styles to your property. From a stately brick or stacked-stone water fountain to a calming water pond or a breathtaking waterfall, call us or e-mail us today for a consultation and estimate on adding a water feature to your landscape. 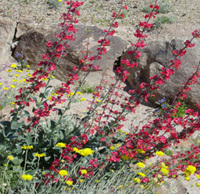 Xeriscape Low Water Desert Landscaping: Xeriscaping simply means water wise or water efficient landscaping. This method of landscaping will result in a more environmentally friendly yard and garden. This achievement is made through the use of plantings which are native to our area as well as other drought tolerant and hearty plants that also require minimum additional water once they are established. Once the proper plantings are selected, the careful process of placing the appropriate plantings in the most appropriate areas of your landscape will begin by properly preparing the soil of the gardening areas to help the plants to grow strong root systems which will result in even less need for additional watering. The xeriscaping process is then ended through the use of appropriate mulch and mulch thickness to further help ensure that the ground surrounding the plants is able to retain as much moisture as possible. Through this carefully planned process, you can enjoy fragrant and colorful blossoms and lush foliage all the while conserving one of nature’s most precise resources. 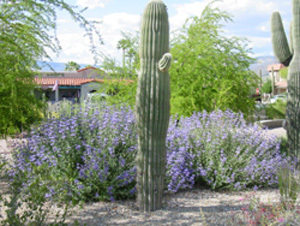 Call us today for a consultation on how we can incorporate the xeriscape process into your landscape. These are just a few of the themed options we can offer you. So Please ask Us what we can do for you we will work with you to create your dream yard that you will enjoy for many years to come. A good example would be in the use of landscaping rocks and accent boulders. If you've ever seen a landscape design that had one large white round boulder here and another large red square granite boulder there and so on, then you've seen that unity wasn't created by this particular element. A simple way to create unity in your landscape is by creating themes. And one of the simplest ways to create themes is by using a little garden decor. Creating a theme garden is easier when it's related to something you're interested in or have a passion for. If you're into butterflies for instance, you could create a theme using plants that attract butterflies as well as using statues, ornaments, and other decor that are related to butterflies. Simplicity is actually one of the principles in design and art. It's one of the best guidelines you can follow as a beginner or do it yourselfer. Just keep things simple to begin with. You can do more later. Symmetrical balance is where there are more or less equally spaced matching elements of the garden design. With a garden equally divided, both sides could share all or part of the same shape, form,plant height, plant groupings, colors, bed shapes, theme, etc. Asymmetrical balance on the other hand is one of the principles of landscape design that's a little more complex. While textures, forms, colors, etc. may remain constant to create some unity, shapes and hardscapes may be more random. This form of balance often has separate or different themes with each having an equal but different type of attraction. Asymmetrical balance isn't dependant on the shape of your garden. It can be but generally it's not. You'll hear me talk about "themes" a lot. Many successful landscape designs follow a basic theme to achieve most of the principles of landscape design described on this page. Natural transition can be applied to avoid radical or abrupt changes in your landscape design. Transition is basically gradual change. It can best be illustrated in terms of plant height or color but can also be applied to all elements in the landscape including but not limited to textures, foliage shape or size, and the size and shape of different elements. In other words, transition can be achieved by the gradual, ascending or descending, arrangement of different elements with varying textures, forms, colors, or sizes. An example of a good transition would be a stair step effect from large trees to medium trees to shrubs to bedding plants. Transition is one of the principles of landscape design that can be used to "create illusions" in the landscape. For example a transition from taller to shorter plants can give a sense of depth and distance (like in a painting), making the garden seem larger than it really is. A transition from shorter to taller plants could be used to frame a focal point to make it stand out and seem closer than it really is. Don't misunderstand this to mean that if you have a large yard you can't have smaller features or garden decor. Proportion is relative and elements can be scaled to fit by creating different rooms in the garden. The goal is to create a pleasing relationship among the three dimensions of length, breadth, and depth or height. A small water feature can be proportionate if placed in a corner or on the edge of a large area and becomes a focal point of the larger area while creating its own distinct atmosphere. An entire room, sitting area, or theme can be created around it. Other rooms and themes can be created as well. There's a fine line here. It's possible that too much of one element can make a garden or landscape feel uninteresting, boring and monotonous. We hope this information variable and it has provided you with enough basic information to help you become involved in the design of your landscaping, as our customers needs are important to us, please continue to browse our site to find the information you need to make your landscape dreams come true. Welcome to Our Landscapes Design Pricing our services are offered at the following rates. Pricing: The pricing for our services will be based on the product our customer chooses to purchase. Landscape Consultation: These services will be provided at a rate of $50/hr for first hour of onsite landscape consultation and analysis of yard for proper plant placement, landscape irrigation and maintenance needs. Additional hours are to be billed at $25/hr for this service Note: this service does not include a landscape design plan. Landscape Design Services: These services will be provided at rate of $375 to $550 dollars for the initial working plan. This equates to up to 12 to 15 hours of work at a rate of approximately $35/hr. The first hour of these services is included with a prior purchase landscape consultation. This pricing includes additional consultation and 2 blueprint working drawings. Additional time if it is needed will be billed at a rate of $25/hr and will be estimated by how complex and detailed of a plan that you our customer is seeking. *Includes 12 hours of Design Services including the landscape consultation. **Includes 20 hours of Design Services including the landscape consultation. If additional time is needed despending on the complexity of the design it will be billed at $25/hr. Landscape Master Plan: This service will be provided of additional charge of $100 to $150 for a final colorize black line master plan of the landscape. This plan is necessary for any formal presentations of the landscape project. ***Includes colored rendered landscape plan for presentation. Basic Service includes 2 hr of this service , Deluxe includes 3 hours of this service. If you desire additional services or have questions about these services, please feel free to contact us about your landscape needs by using the form on our ContactUs page or by phone or e-mail Thank you! !